I was born in 1934... the 12th of February 1934, in, I think, a flat in Kensington - 24 Cheniston Gardens, which is off Kensington High Street. My dad was, at the time, a priest in charge of Christ Church, Victoria Road. He was an Anglican clergyman and it was a very posh neighbourhood in those days, sort of full of major generals and peers and all that kind of thing, and he wasn't vicar of it because the church came under the wing of St Mary Abbots, the main church in Kensington but he was curate in charge or priest in charge. And, I mean, such was it that my mum always told me (I don't know whether it's true) that when I was born, they got 350 woolly coats, which were absolutely useless, had to be given away, that the little baby could wear. But it was that kind of very much upper-class, Edwardian era, which lasted in places like Kensington much longer than people think. And that's where I spent the first two years of my life. Can't remember it at all, clearly, and then in 1936, we moved to Highgate, where my dad was made vicar of Highgate at St Michael's Church there and that's where, I suppose, my formative years were spent, the next ten years indeed, until 1946, until after the war. And we lived, I think, in a not very nice vicarage, which he'd actually had to acquire because the old vicarage was fallen down in Southwood Lane and I went first of all to various, sort of, kindergarten schools. And then, in about 1942 or thereabouts, I went to Highgate Junior School, which was the junior school of Highgate, which was a minor public school, I suppose, but perfectly adequate, and stayed there until '46 when my father moved again to Kensington and to St Peter's, Cranley Gardens, now defunct, or now not… I think it's now sort of taken over by the… oh, what are they called? I don't know. But it's no longer a Church of England church. And we were there for four years and then I went to school at Westminster, which was on the tube. And... I was a day boy at first, became a boarder by the end. That was at my education, partly because… I think this was very odd, they decided to send my sister away to school at Cheltenham Ladies' College and I was left at home on my tod as a boy, really rather lonely. And it became clear to me in time that if you wanted to make progress and, sort of, be in school plays and in, sort of, house teams and stuff, it wasn't much good leaving the school at five o'clock and therefore I agitated, and goodness knows how they afforded it, and I became a boarder. I imagine it must have been about 1948, '49, or something and stayed at Westminster until I went up to Oxford in 1952, to Christ Church. And that was, I suppose… oh it wasn't the end of my education, no, because I decided I wanted to be a barrister, and so I started, sort of… I read law at Oxford, great mistake, very sterile study law, very sterile academic study, anyway. And went… sort of, to eat dinners, you had to do to qualify to be a barrister. And I never, of course, went to the bar. But I was called. I was called to the bar. And I can still sign passports saying, barrister-at-law, that kind of thing. But I did practice a bit in the army, as a defending officer, because you had to do national service in those days. And I… I think they got to know, in the battalion, which was with the Royal Fusiliers, they got to know that Mr Howard is a trained barrister and therefore all the boys on sort of AWOL charges, absence without leave and that kind of thing, said, 'I'll have Mr Howard as my defending officer'. I was only a second lieutenant, but I did rather enjoy it, because it meant that you could stand up before this court-martial and say to your own company commander: 'Major Derkin, would you describe yourself as an experienced officer?' [He said] 'I think I may do that!' [I said] 'I see. Will you now look at this document, which is your annual report on Corporal Hayes Rosario, and compare it with what you just told the court, that he was a thoroughly unreliable NCO? You write here he was an ideal NCO. How do you reconcile those two?' It didn't do me any good in the officer's mess. They loathed it. But I did enjoy it, I think. And that was just two years. And when I came out of the army, I no longer wanted to be a barrister and that was partly because the army had turned me into a journalist. When I went into national service, I think I said to myself, 'You must always write about what you know'. And there was this great slab of experience in front of me, of being a national serviceman and training and all the rest of it. So I started, strictly against Queen's Regulations, in, sort of, writing for various weekly papers and stuff, including, actually, the New Statesman, what it was like being in the army as a national serviceman. And I can remember at the very end of it, I was suddenly asked out to supper by the editor of a very obscure Sunday paper called Reynold's News, owned by the Co-op... long since defunct. And they took me to some rather grotty restaurant at the bottom of Gray's Inn Road, which is where the Pioneer House... where the paper was published. And we talked about this and that, and then they suddenly said, because there were two of them there, the managing editor and the editor, 'We'd rather like you to join us'. And I said, 'What?' They said, 'Yes, we'd like you to come and write for us'. And I said, 'Well, that's very flattering. Thank you very much'. Then the next thing they said was, 'Terribly sorry, we can't pay very much'. And I, with some skill, I think, said, 'What do you mean by not very much? What is not very much?' And they said, 'Well, we couldn't pay any more than £1500 a year'. Now, we're talking… this is 1958... I was in the army and I think I was earning £5 a week as a second lieutenant so £1500 a year was riches beyond the dreams of avarice. And more or less at that moment, I think I decided I'd become a journalist because you couldn't make a living at the bar in those days, you know. You had to pay for your pupillage and you had a very hard struggle. And people like Jeremy Thorpe hadn't prospered, people like Robin Day hadn't prospered. And I thought to myself, look, if I go to the bar, I'm going to have to go on living at home, I'm going to have to commute (my dad was then vicar of Epsom in Surrey) and it's going to be misery. So I took up the offer from Reynold's News and became a journalist, and that's what I've done ever since. 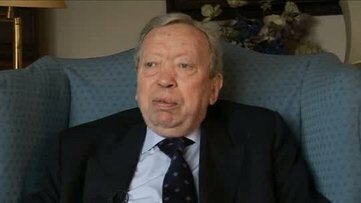 A distinguished British political observer, Anthony Howard (1934-2010) wrote for 'The Guardian', 'The Sunday Times' and 'The Observer' for over 40 years, during which time he has commented on the historical significance of global political issues. He was also editor of 'The Listener' and 'The New Statesman', and a reporter on both 'Newsnight' and 'Panorama'. He was awarded the CBE in 1997.